Are you ready to get organized?! Take a look at these 7 inspiring linen closets and learn the 5 elements of linen closet organization that you can easily recreate in your own home. Nearly every time the husband get sick he buys a new package of cold and flu medicine. Why? Well, because it’s nearly impossible to find anything in our linen closet. It’s a complete disaster. I bet we have at least 5 different kinds of cold and flue medicine in there…but good luck trying to find them. It’s not like I haven’t tried to organize the linen closet before. I have! But nothing seems to work long term. Eventually, stuff just gets shoved in there with no organization at all, and then we find ourselves in the messy situation again. 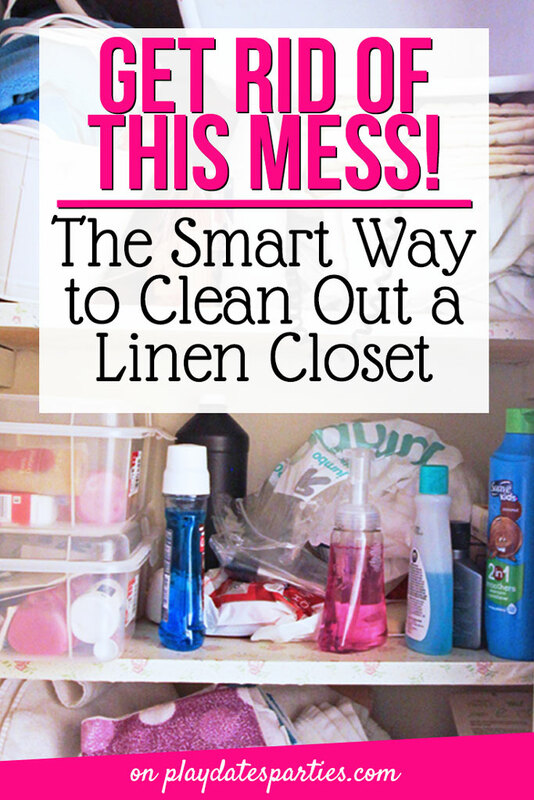 That’s why I’m taking on our linen closet (and some open shelving) for the One Room Challenge this fall. It’s time to dig deep and do it right. .
No, I’m not going to wing it. Over the next 6 weeks, our tiny little linen closet will be transformed from disaster to dream. And I’m ready to jump right in. Here’s a quick look at our linen closet as it is right now. What a mess! And here’s the open shelving I mentioned as well. I can’t believe we let this sit out in the open for all our guests to see! So, now it’s time to get to the inspiration, right? Not quite! A good design plan starts with inspiration. That’s right. 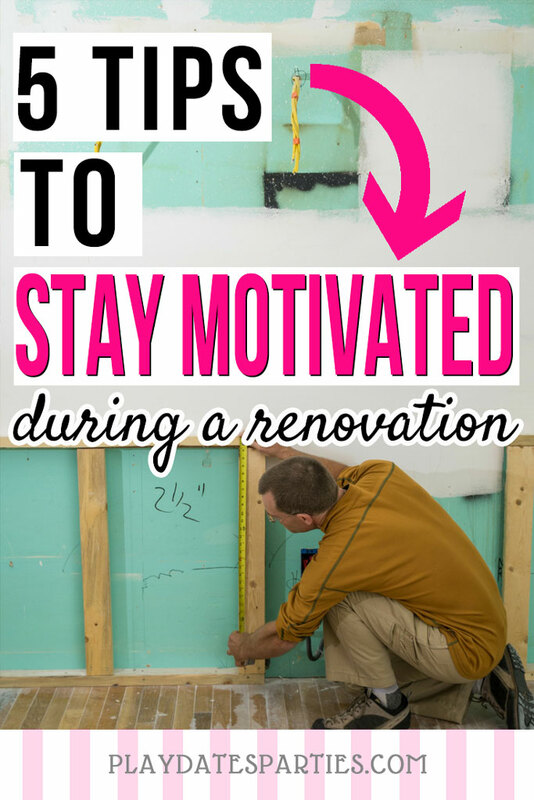 It doesn’t start with purging, or pulling together a shopping list, or even identifying what projects to make. You’ve got to first figure out what inspires you. The easiest way I’ve found to do that is to start with browsing sites like Pinterest and Google Image search for your project. Keep an open mind and don’t worry about looking for anything specific. All you want to do is collect a bunch of images that you love. Only then do you pull it all together. You see, when you put several images together that inspire you, you are better able to see what the common elements are. And that’s what you want to focus on when designing your final space. Let’s take a look at what that means for linen closet organization and open shelving, shall we? All of the linen closets above are beautiful on their own. But when you see all the pictures together, the common design really becomes obvious. The overall feel is neutral and sophisticated. While brightly colored plastic bins are inexpensive, the inspiration photos show I need to steer away. Otherwise, I’ll be disappointed in the result. 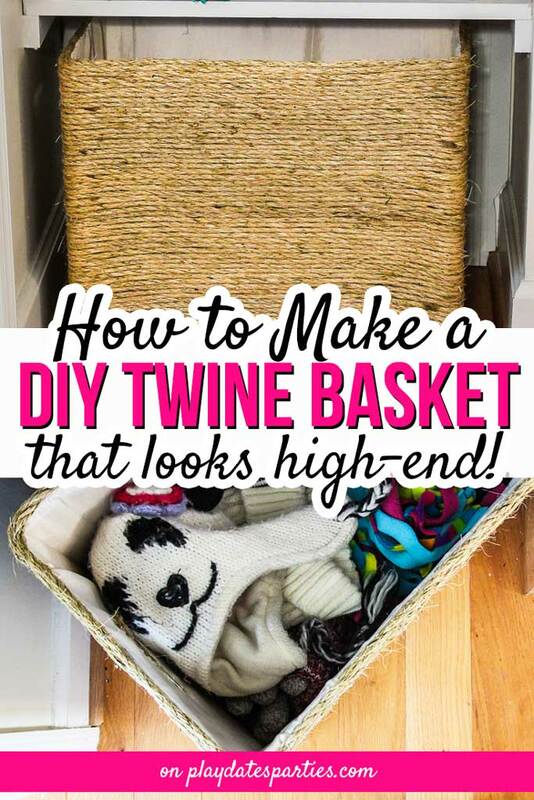 Baskets are a great way to store the ugly items in your linen closet. Not only do they add visual texture, but they make it easy to keep similar items together. Wire or metal baskets are sturdier than woven baskets. They’re great for large, similar items, like toilet paper and paper towels. They also add a bit more dimension and visual interest to your linen closet organization. Our linen closet is barely two feet wide, and the shelves are only about 11 inches deep. That’s not a lot of storage for a family of five. 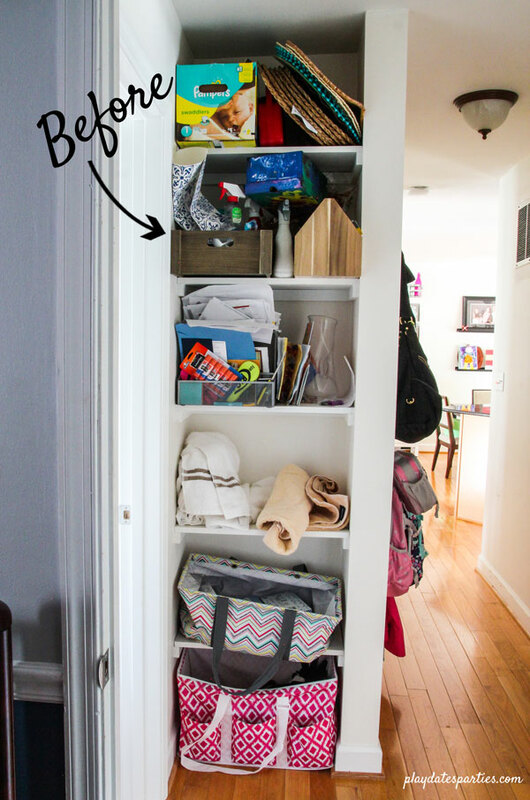 Adding storage to the back of the closet door is going to be crucial to keeping us organized. Obviously we attempted this before with the hanging shoe bag. And as you can see from the before pictures, it didn’t work at all. I recommend sticking to narrow shelves or hanging rods. That way you can keep things a bit more organized. The space between the floor and the bottom shelf is usually the tallest. That means that it is easily the space that gets stuffed with the heaviest and bulkiest items. Make life easy for yourself and use rolling or sliding storage on the floor whenever possible. I’m not sure we’ll be able to do anything built-in, but I love the idea. 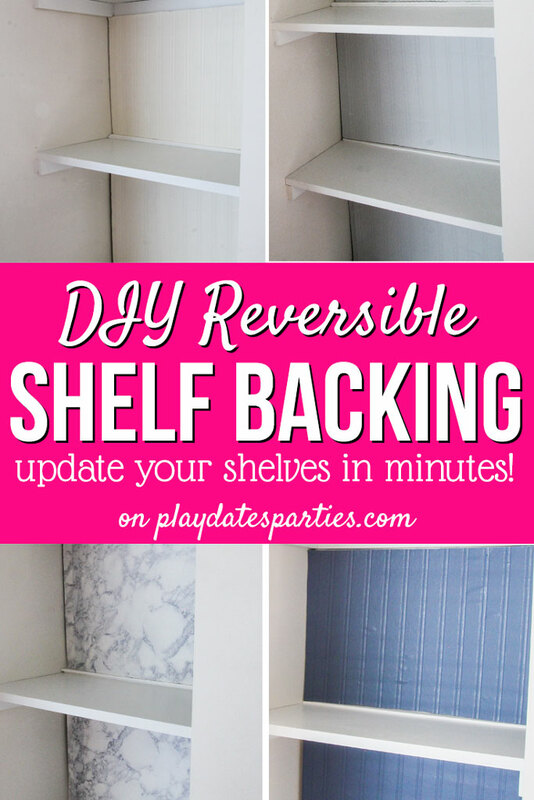 It’s especially functional for shallow shelves that are created between studs. The beadboard on the back of several of these shelves adds so much texture without being fussy. It’s a great way to make the a set of open shelves look nicely finished. 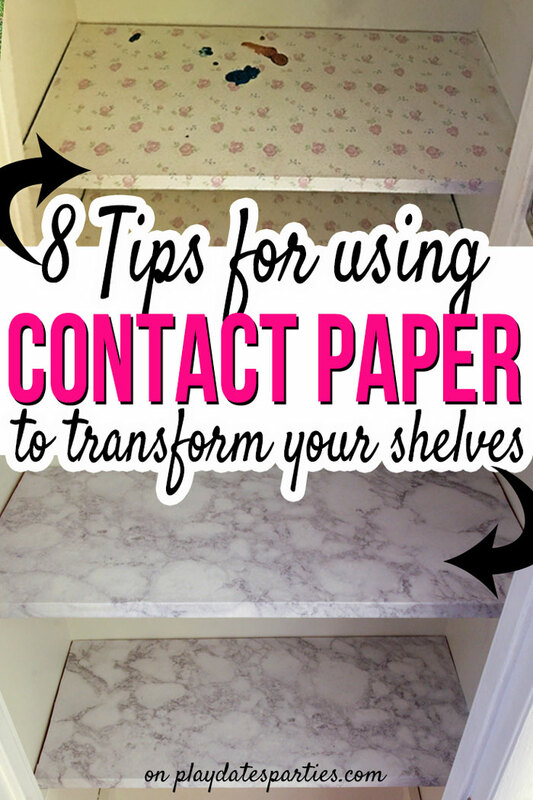 Both open and closed-top boxes are a great way to keep clutter from spreading all along the shelves. Plus, they look pretty, too! Hopefully you can now see how important it is to create the right kind of design plan for your space before you get started. Armed with this, and the 5 ways to recreate the perfect linen closet organization, we can both now begin the journey toward a less-cluttered life. Though, honestly, if we can just avoid having 5 or more boxes of cough and cold medication at any given time, I’ll be happy. What are your best linen closet organization tips? Do you prefer colorful or neutral closet storage? Oh dear – not in ages. Cassidy and I have a funny system. I will say that I often clean it out of all the free toothbrushes or products I got from blogging (or the dentist) and I donate them all to charity, and then it all gets nice again. I’m into colorful designs so much. Luckily Cassidy is too! So many great resources here! Thanks for the much needed inspiration. My linen closet is frightening. Pinning for later. This is definitely a project in my future :). Oh come do my linen closet! Every time I open it, it saps my will to live! I love this and I am going to apply it to my actual closets because those are worst than my linens! Hoarding baby stuff is real!!!! I love the ideas you have to improve storage and add a stylish flair. I am constantly changing my linen closet based on my boys. I have twins in college. When they come home with their junk, a lot of it ends up in storage, but some things change with what they take and leave. So, I have to adjust what we have in the closet. However, I only use mine for towels, linens, blankets, comforters and cleaning supplies…at the bottom and bag storage. 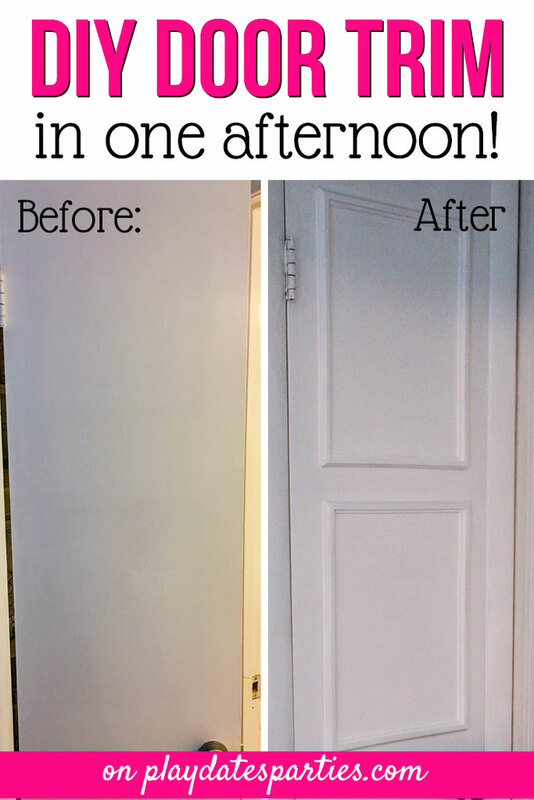 Our linen closet needs a makeover too and I love the idea of the one room challenge! You’ve inspired me to either tackle our wreck of a linen closet OR our totally boring dining room. I’ve let my linen closet go..and go..and go. It’s just piles of towels really. These are pretty inspiration photos. Can’t wait to see your finished product! 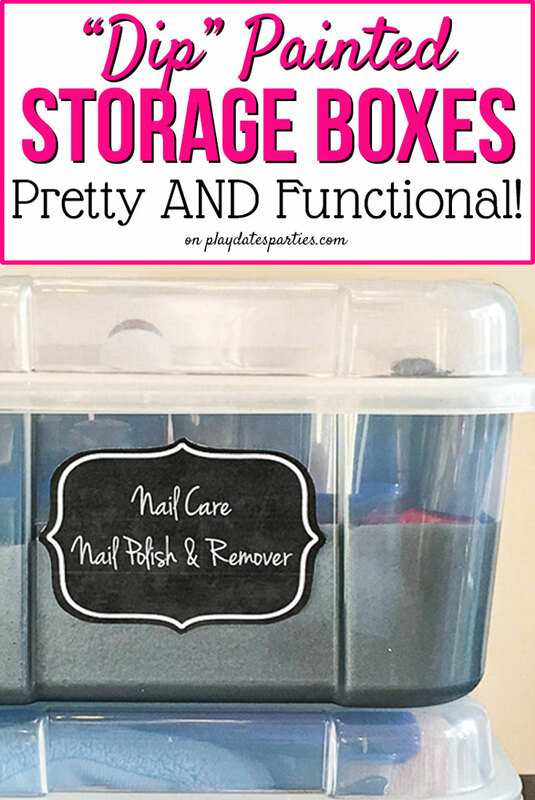 Love these organization ideas! It’s time to clean out and organize my own closet, and now the task doesn’t seem quite so daunting. Thanks! My linen closet looks pretty close you yours! I can’t wait to see what you do with it. Thanks for linking up to Merry Monday! Pinned! Have a great week! I need to do this so bad, it’s not even funny! Great tips! 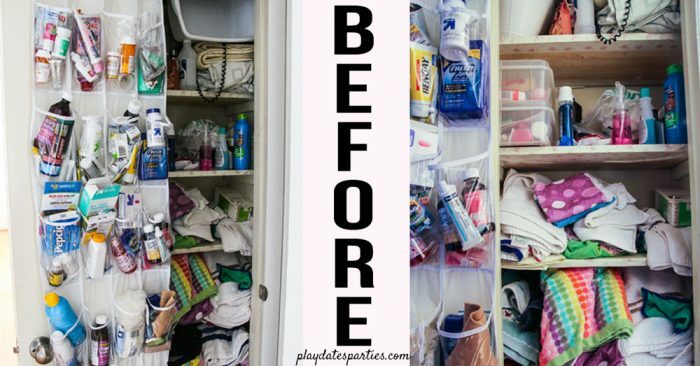 As you can tell by the before photos, our linen closet was in dire straights. Having it cleaned up and organized is so wonderful! Great inspiration for a linen closet and other storage spaces. Aren’t those closets gorgeous! It’s always fantastic to start with good inspiration. I love this! Our linen closet is not terribly unsightly, but it certainly isn’t pretty. I’d love a “pinterest worthy” linen closet. 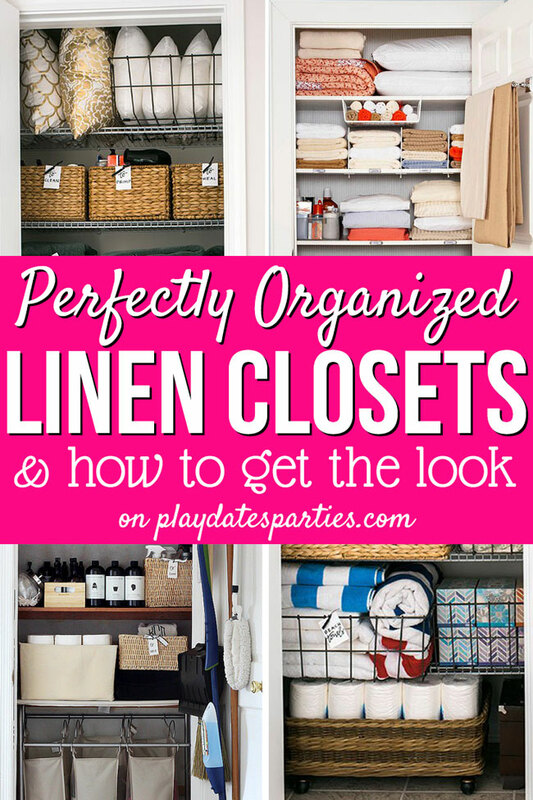 It’s been wonderful having an organized linen closet…and I don’t let the family mess it up, either! I think the most important thing we figured out was finding a system that makes it EASY to maintain. Then you make the rest of it look pretty. Thanks for stopping by and for saving! Great inspiration for organizing a linen closet. I refer to my closets like this as rat’s nests. Things seem to magically collect and become jumbled and lost inside of them. I will be very interested to see what you do. Thanks for sharing! YES! This was the problem we had. We could never find anything, and then we would end up buying more and more of what we already had. Now we can find things easily and avoid duplicate expenses. For me, it’s my large pantry/craft room/baking pan storage/dog supplies cluster that’s the problem. I should tackle it…someday! Visiting from Saturday Shuffle party. Oh, yes. I’ve spent the last few weeks taking any extra time I had to purge my party and craft supplies. It’s amazing how much stuff accumulates that we don’t use! So glad you like them Mimi! I am a compulsive neat freak but even i let my closets get a bit messier than I’d like. I typically go through and organize each winter just after christmas; pulling out everything, deciding what to keep and what to toss and then putting like stuff with like stuff. I’ll buy bins an d label them too… It makes me so happy to take a messy eye sore and make it look pretty again. There are some really great ideas here!! Isn’t it awesome to see a mess turn into something gorgeous? My closet is done now, and these images were so helpful. I hope they help you too! Such great ideas! Thanks for sharing!! Our linen closet is really just a couple of cabinets. I would love to have a real closet. In addition to towels and bedding, ours has cat food.in it. Ha! Made me feel so good to purge a bunch of stuff out of it last year. 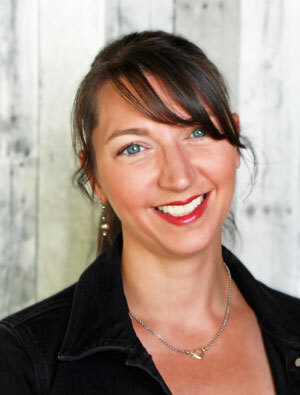 Love those modern styles you chose! Each one of them is something I would like! Our linen closet is pitifully small. Purging definitely helps. The hardest part is actually maintaining the organization! Thanks so much for stopping by! Truly inspiring to declutter and transform those overflowing shelves and drawers into a bright and open storage space! Love it 🙂 Happy Thursday! Thanks so much Maisy! We love our cleaned up linen closet, and this inspiration was instrumental in getting us there. These photos are so inspiring; and that is good advice to start the project with an inspiration board! Since it’s so much fun to do that, I am excited to take that step! Thank you for presenting a good plan to follow! 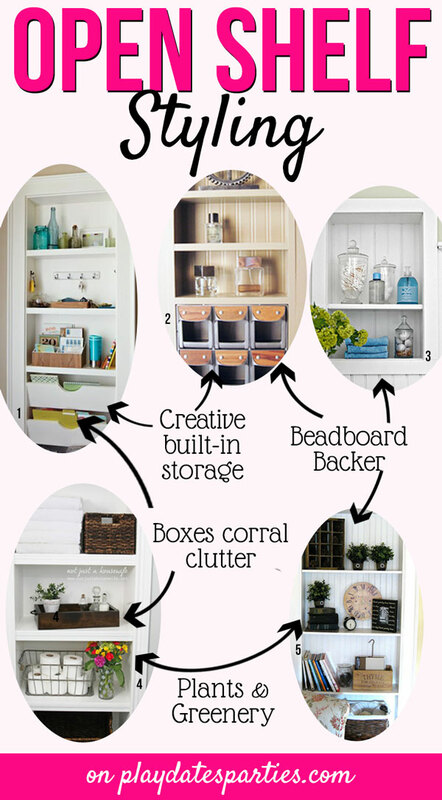 So many great organizational ideas! There are so many cute baskets and jars now days. I have open shelving in our basement linen closet. It stays neat and tidy, but it’s not used very often. Makes a big difference. 🙂 Thanks for sharing with SYC.